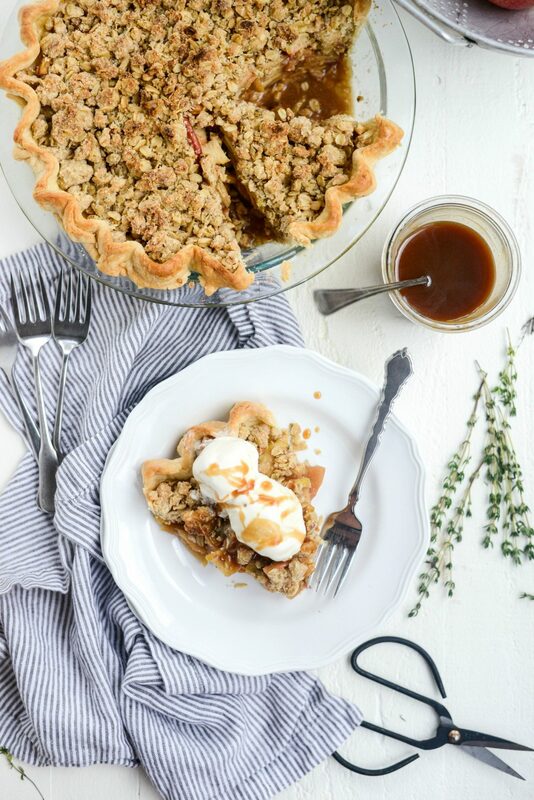 In this rustic Brown Sugar Apple Pie, a mixture of golden delicious and honeycrisp apples are tossed in butter, brown sugar and cinnamon and baked in a pie with a oatmeal thyme crumble. 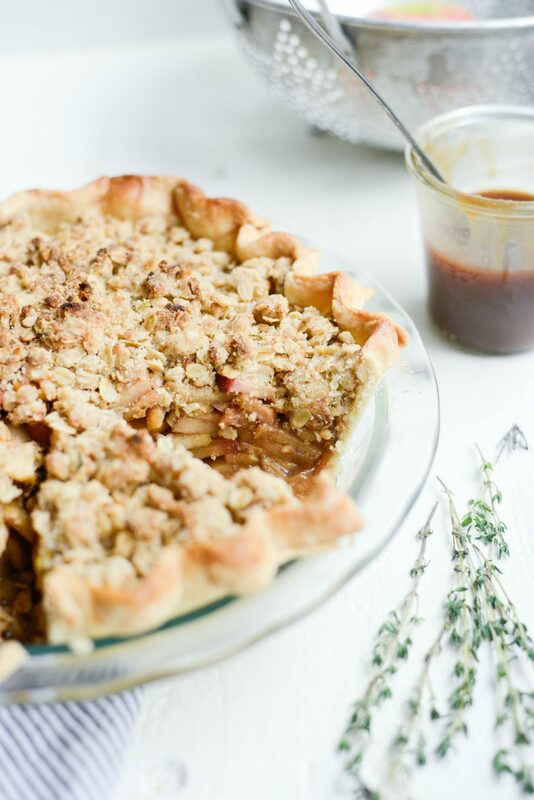 Because the apples pre-cook your pie won’t cave or shrink. Makes one 9-inch deep dish pie. Last Wednesday was my birthday. We celebrated by Pat picking up Chinese food from our favorite restaurant (at my request) and for dessert I made this brown sugar apple pie. The two don’t really make a cohesive meal, but when it’s your birthday you can have your dumplings and cake, er pie, too. I decided to put a rustic spin on my traditional pie recipe by using a couple different types of apples and leaving their skin on. I’m such a rebel. My goal was to make this pie as simple as possible, aka no double crust. I instead made a single pie crust and pulled together a quick oatmeal thyme crumble. 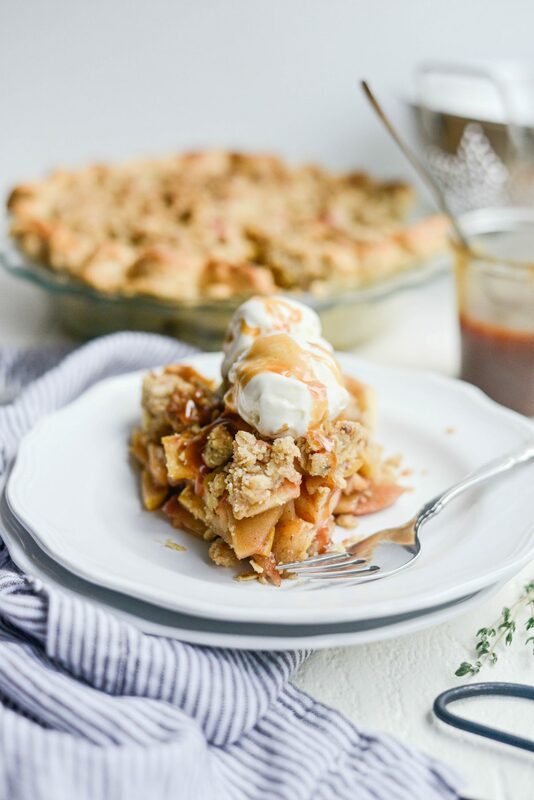 Apple crisp meets apple pie. 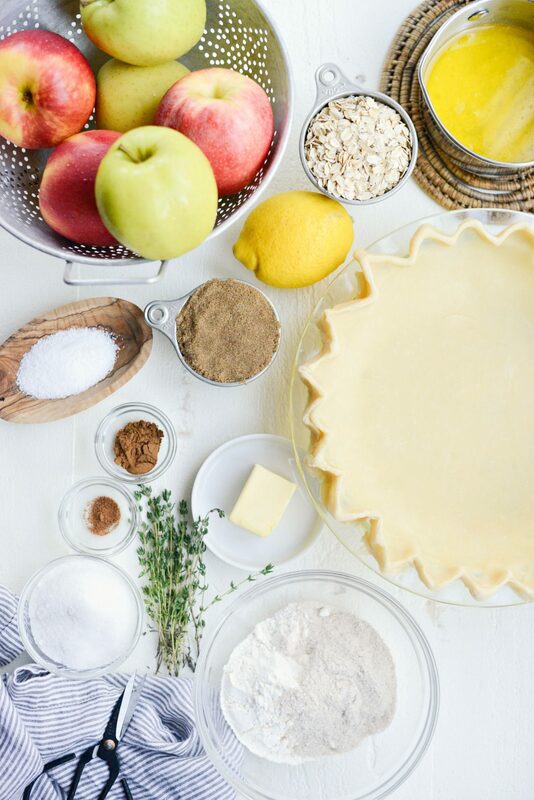 Here’s what you’ll need: 1 bottom crust (1/2 of this recipe), 3 pounds of apples -I use golden delicious and honeycrisp, 3 tablespoons unsalted butter, 1 tablespoon lemon juice, 1/2 cup dark brown sugar, 1 teaspoon ground cinnamon, 1/4 teaspoon ground nutmeg, 1/8 teaspoon kosher salt. 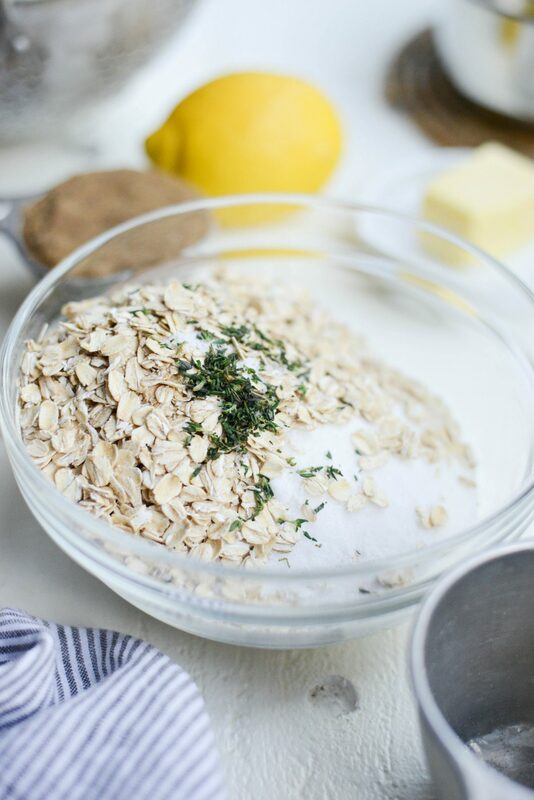 For the crumble you will need; 1/2 cup unbleached all-purpose flour, 1/4 cup whole wheat flour, 1 cup old fashioned oats, 1/2 cup granulated sugar, 1/2 teaspoon minced fresh thyme leaves, 1/4 teaspoon kosher salt and 6 tablespoons of melted unsalted butter. 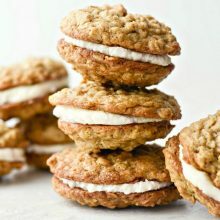 In a medium bowl, measure and combine 1/2 cup unbleached flour, 1/4 cup whole wheat flour, 1 cup old fashioned oats, 1/2 cup granulated sugar, 1/2 teaspoon of minced fresh thyme leaves and 1/4 teaspoon kosher salt. Stir to combine. 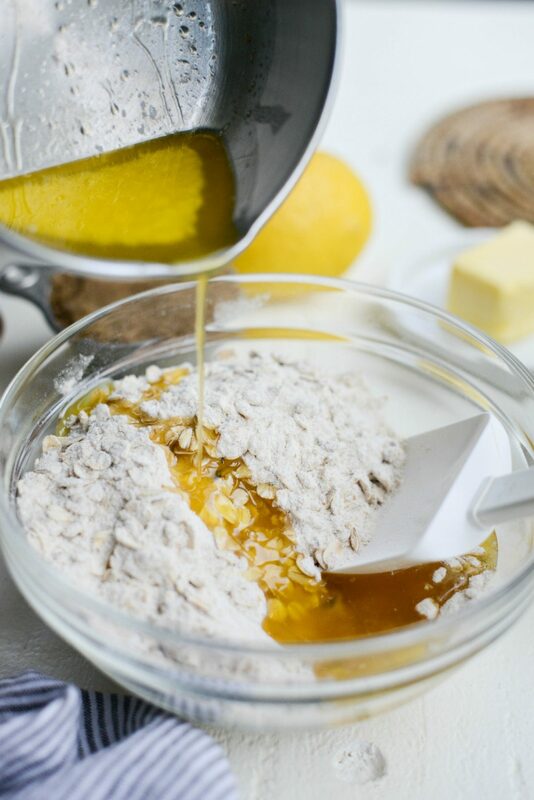 Next, pour in the melted butter and stir until it is absorbed into the oatmeal mixture. Set this bowl off to the side for a moment. 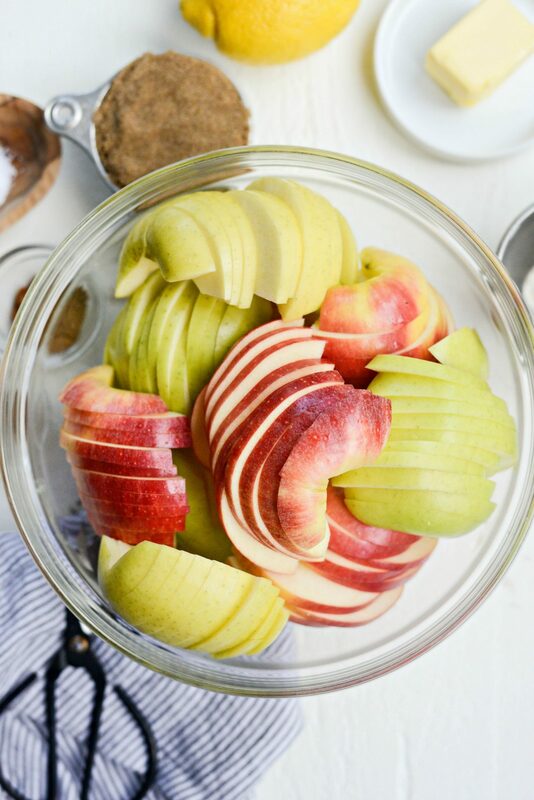 Next cut the 3 pounds apples in half, remove the core and slice about 1/4 of an inch thick. Heat a 12-inch, deep sided skillet over medium-high heat. 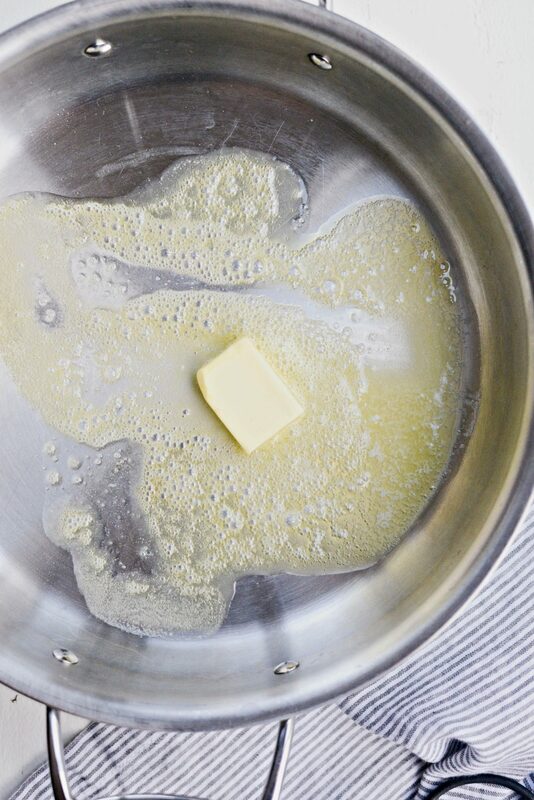 Once hot, add in the 3 tablespoons of unsalted butter, it should sizzle but not instantly brown. Then add in all the apple slices, toss them in the butter and cover to cook for 5 minutes. The apples should have softened but still are a bit firm. 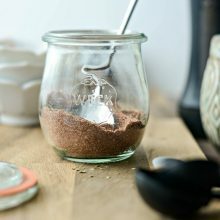 Next squeeze in 1 tablespoon of lemon juice and measure in 1/2 cup of dark brown sugar, 1 teaspoon ground cinnamon, 1/8 teaspoon ground nutmeg and 1/8 teaspoon kosher salt. Next turn the heat up to high and cook until the liquids release from the apples has thickened. About 2 to 3 minutes. 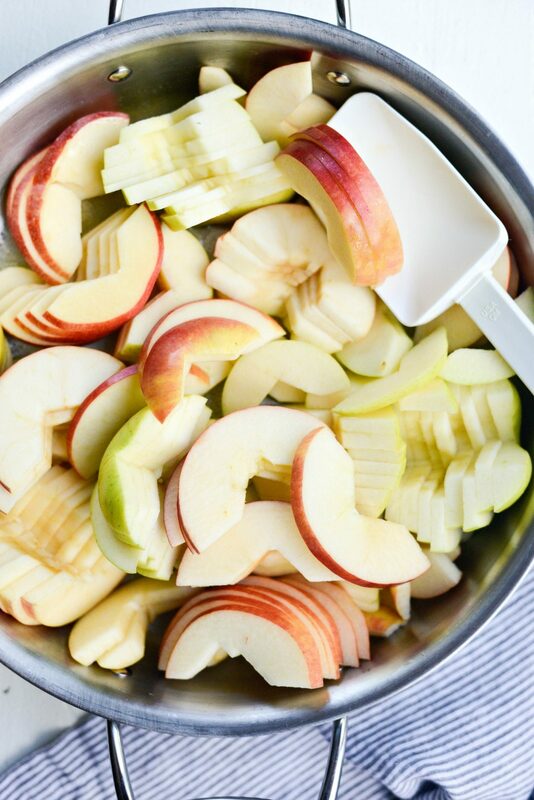 Transfer the apples to a rimmed metal baking sheet. Spread them out evenly and allow them to cool. The apples still hold their shape well because you par-cooked them earlier. 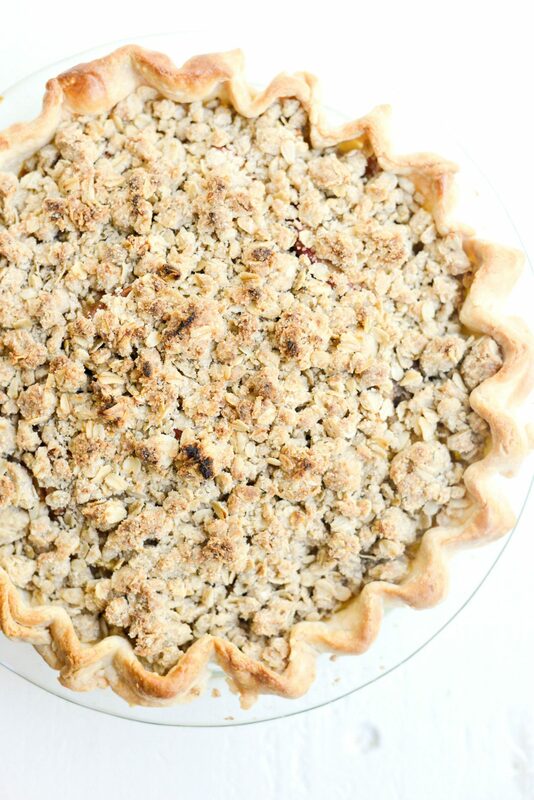 Most importantly, par-cooking also “pre-shrinks” the apples so they fill the pie nicely and keep the crumb topping from sinking in. 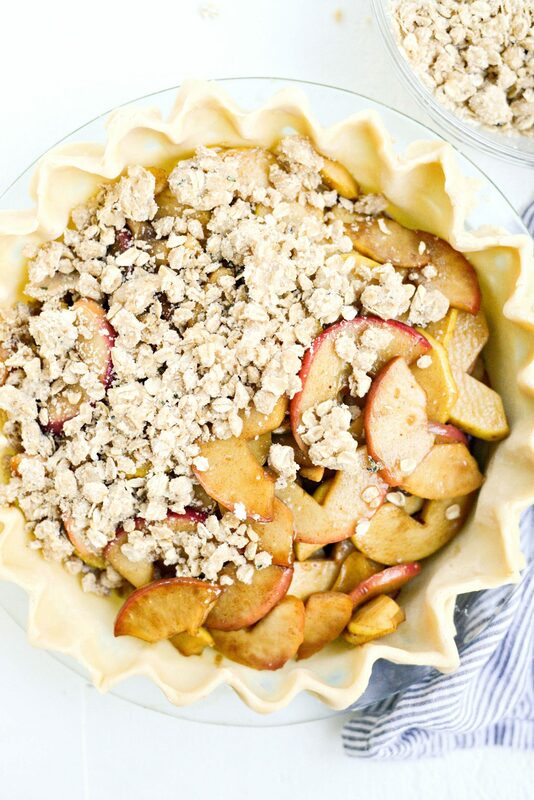 Remove the prepared pie crust form the fridge and add in the cooled apples. My apples released a lot of liquids so I only added half of the juice from the pan. Side note: when I was washing the apples, I noticed a sticker on one that suggest that I must have picked up Rave apple which aren’t recommended for baking because they’re super juicy. So let this be a PSA on double checking the apples you pick and also, do your research on apples. Not all apples are meant for pies. 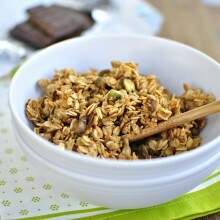 Next sprinkle the oatmeal thyme crumble over top. 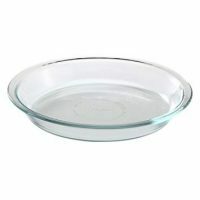 Place your pie onto a rimmed metal baking sheet (to catch any juices if they should bubble over) and bake in the lower third of your oven for 20 minutes. 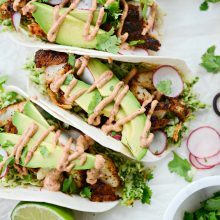 Rotate the pan and reduce your oven temperature to 375° for 20 to 25 more minutes. Finally we’ve reached the last stage. 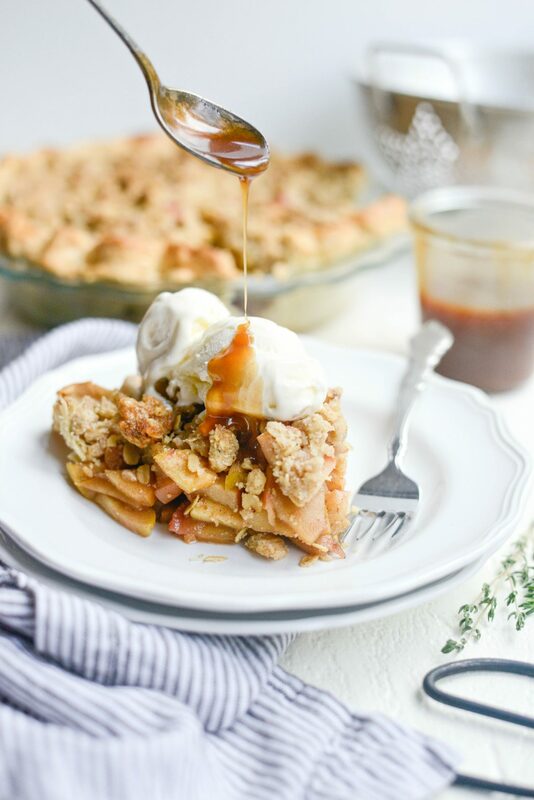 Allow your brown sugar apple pie to cool for at least 3 hours before slicing and serving. It’s just that simple. And rustic. 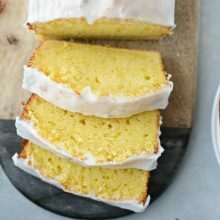 Lastly, slice yourself a piece and top it with a scoop of vanilla ice cream. 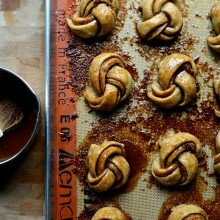 Maybe a drizzle or three of caramel sauce too. 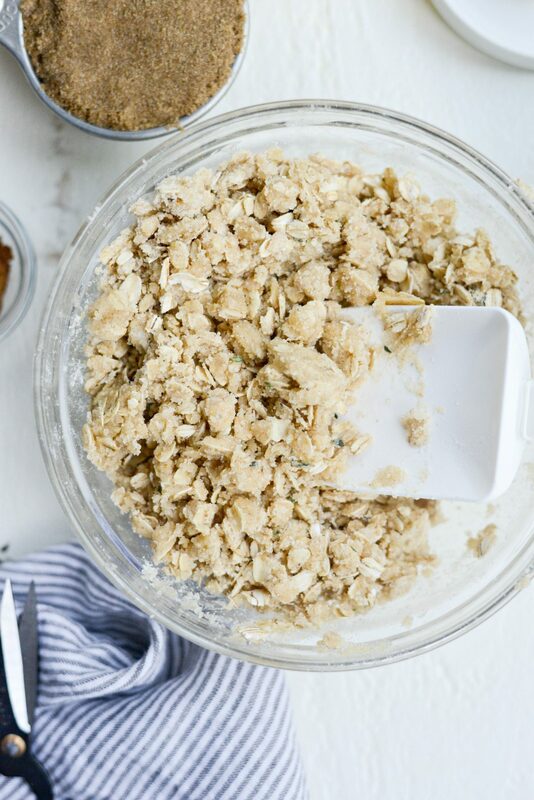 Lastly, before I go, let’s talk about the oatmeal thyme crumble topping. You might be thinking, “thyme in crumble?” Well, to be honest, I’ve made this exact crumble before, but with a cherry pie. Therefore I figured that thyme and apples would work similarly as it did with cherries. And it does. The thyme is super subtle and adds a delicious herbaceous goodness. 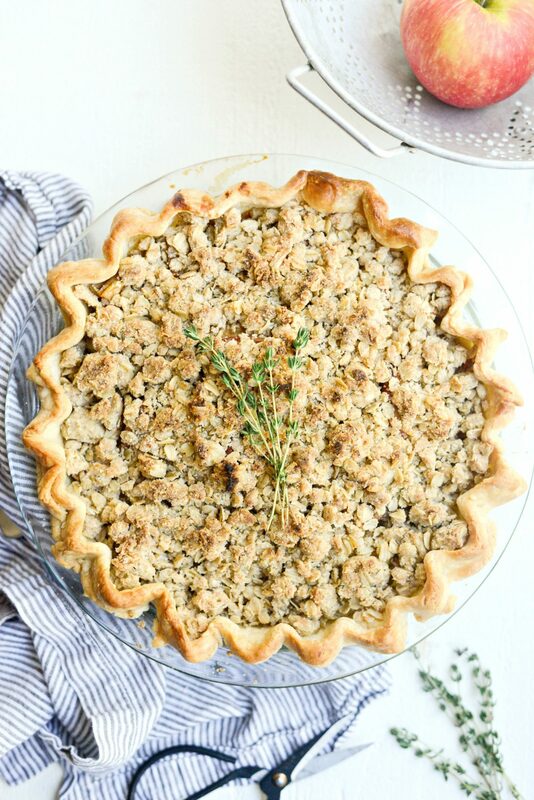 The oatmeal in the crumble adds a wholesomeness to this pie. Not to mention delicious texture. Enjoy! 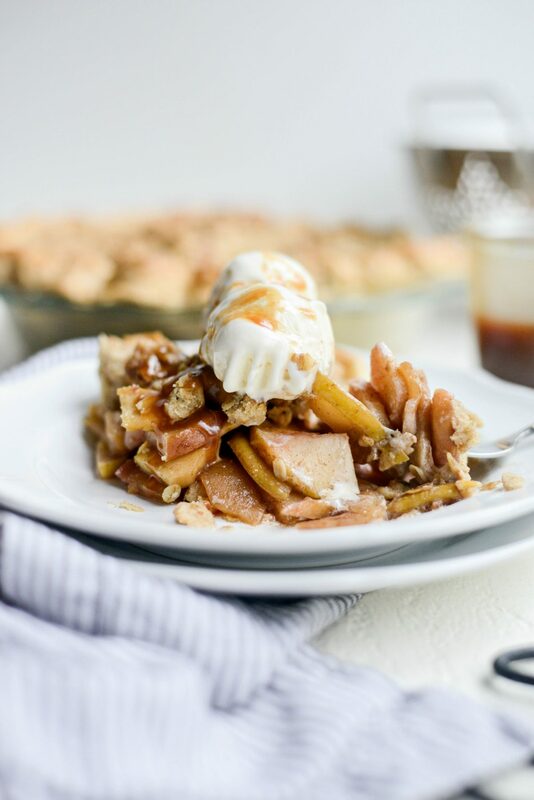 And if you give this Brown Sugar Apple Pie recipe a try, let me know! Snap a photo and tag me on twitter or instagram! 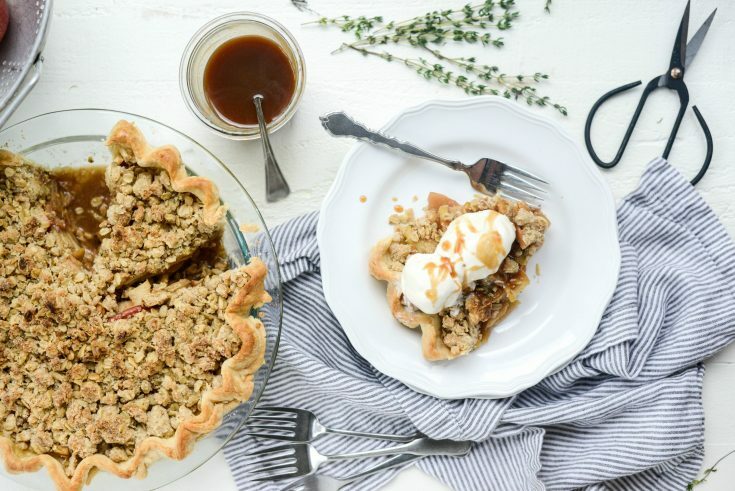 In this rustic Brown Sugar Apple Pie, a mixture of golden delicious and honeycrisp apples are tossed in butter, brown sugar and cinnamon and baked in a pie with a oatmeal thyme crumble. 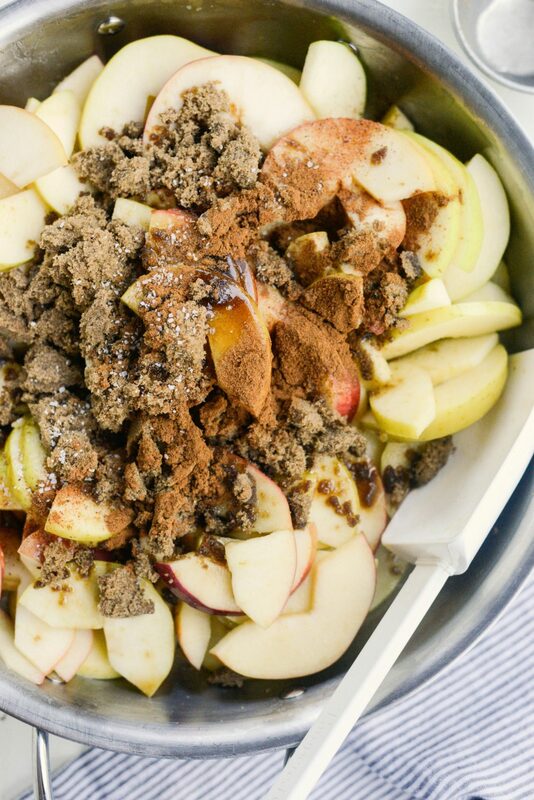 Because the apples pre-cook your pie won't cave or shrink. Makes one 9-inch deep dish pie. 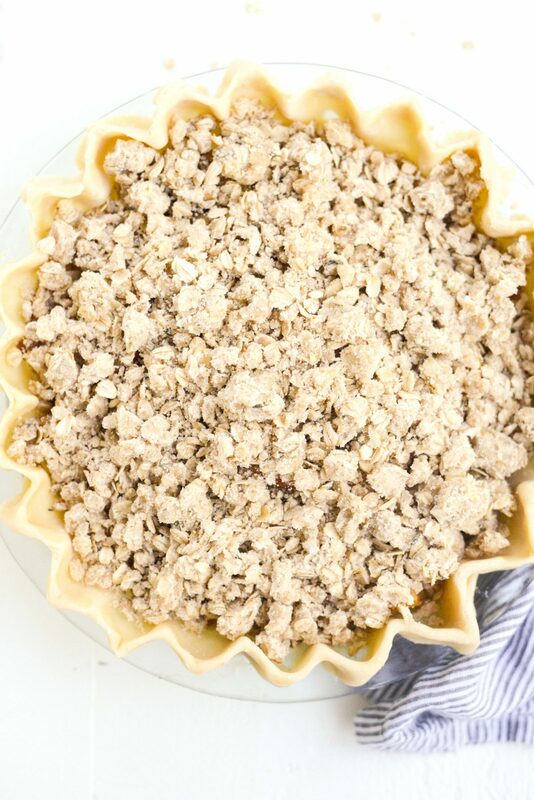 Roll out the bottom pie crust to 12-inches in diameter and place into a 9-1/2-inch deep pie dish. 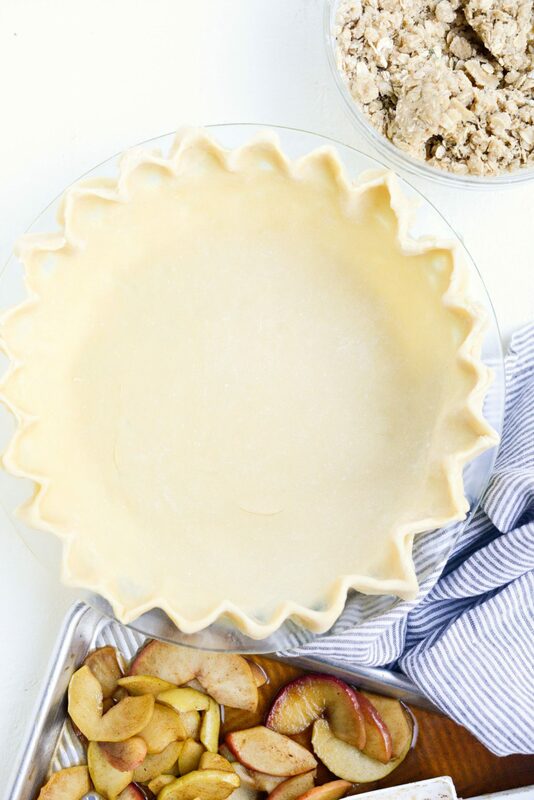 Trim off excess pie crust, leaving a 1-inch border. Fold and pinch the edge. Refrigerate while you prepare the rest of the pie. 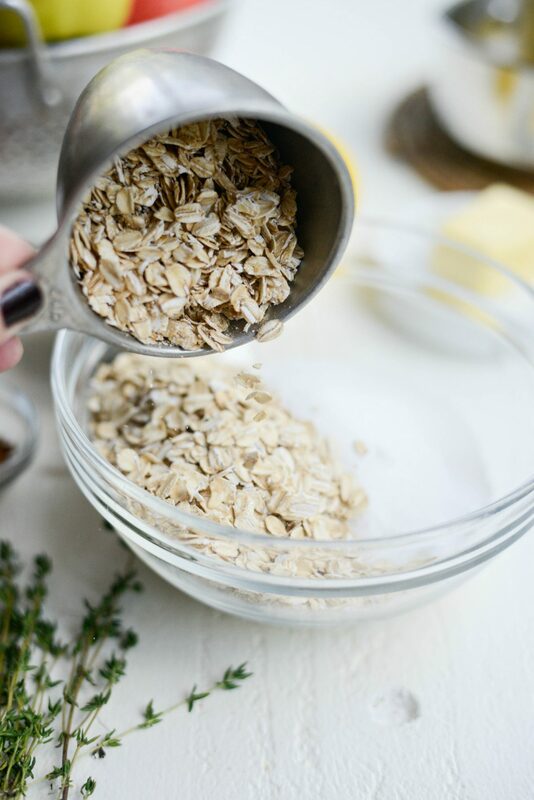 In a medium bowl combine the oats, flours, sugar, thyme and salt. Stir to combine. Pour in the butter and stir until absorbed. Set aside. Heat a large 12-inch skillet over medium-high heat. Once the pan is hot, add in the butter - it should sizzle. Add in the apple slices, stir to coat in the butter. Reduce heat to medium, cover and cook stirring occasionally until the apples are softened on the outside but still slightly crunchy on the inside. About 3 to 5 minutes. Next stir in the lemon juice, 1/2 cup of dark brown sugar, cinnamon, nutmeg and salt. 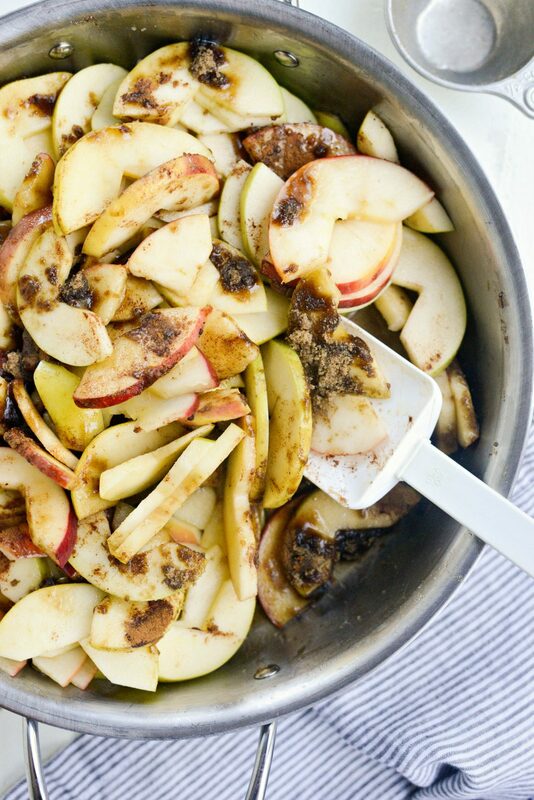 Increase the heat under the pan to high, stir often until the juice release from the apples and thicken slightly. About 3 minutes. 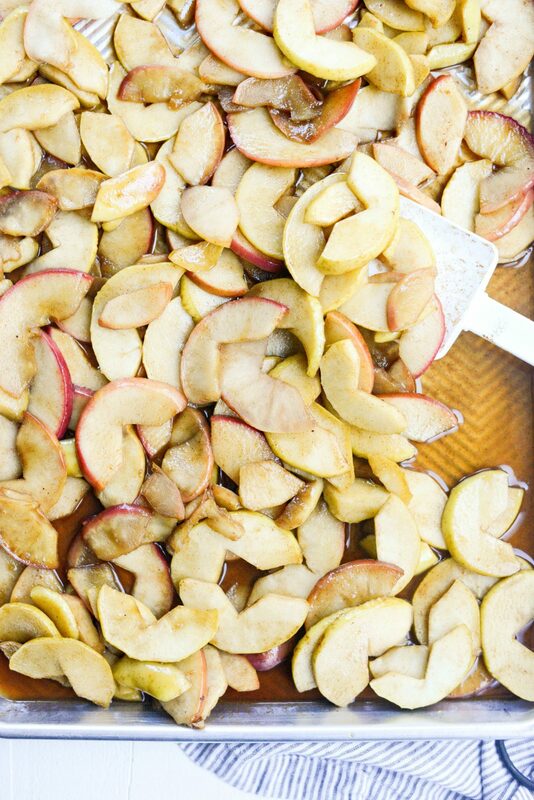 Spread apples (and any accumulated juices)onto a rimmed metal baking sheet to cool completely. About 20 minutes. Once the apples have cooled. Pour them into the chilled pie shell. 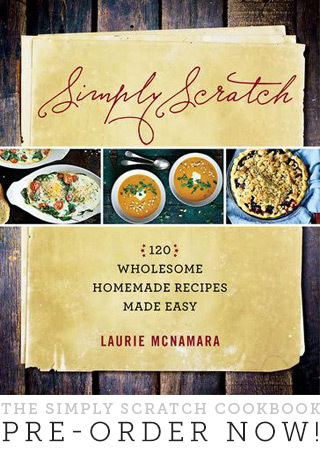 Pinching the crumble between your fingers, scatter the crumb topping evenly over top of the apples. 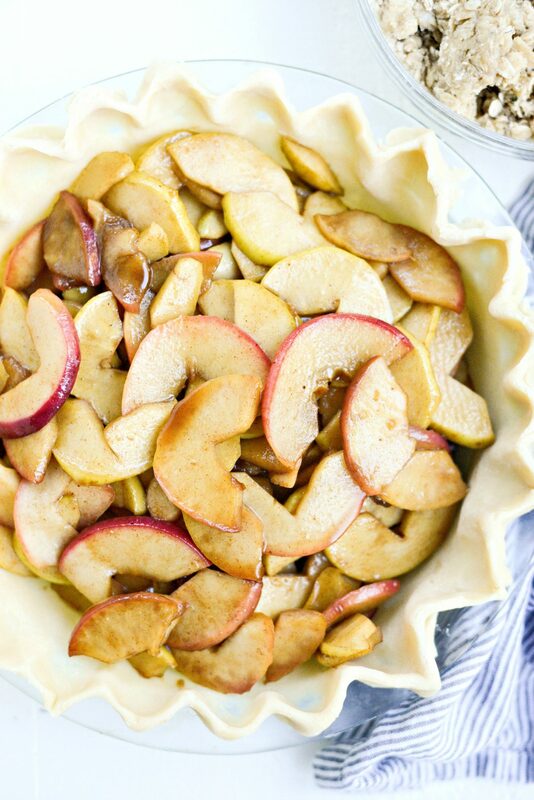 Set the pie on a rimmed metal baking sheet before sliding the pie on the lower-third rack of your preheated oven. Bake for 20 minutes. 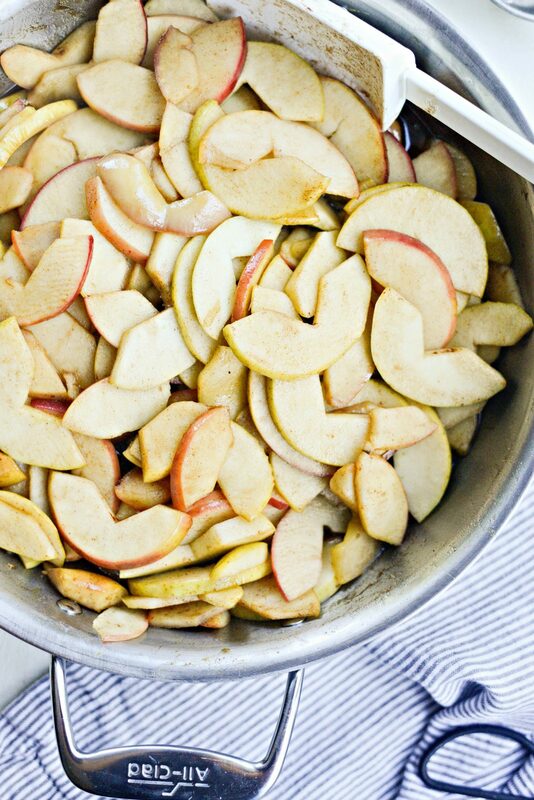 Reduce the heat to 375° and continue to bake for 10 to 20 minutes more or until the apples are bubbling. If the topping and crust edges are getting too brown, cover the pie loosely with foil.